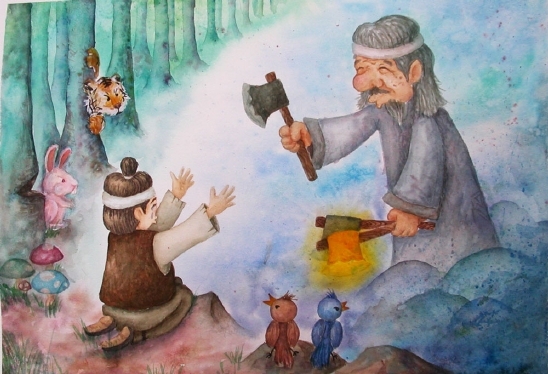 Gold Axe Silver Axe which is also known as The Honest Woodcutter or 금도끼 은도끼 is a traditional Korean story or fairy tale. The story is basically a Korean version an Aesop’s Fable of the same name,. The story focuses on a Woodcutter who accidentally drops his axe into the river, and then starts crying. Seeing this the God of the mountain dives into the river and bring out a Gold Axe. When asked if this was his axe the woodcutter honestly said no. After this the God of the mountain dives back into the river and retrieves a silver axe, but once again the woodcutter is honest as doesn’t claim this one either. Because of his honesty the God of the mountain gives the man both axes plus the one he lost. Later a neighbor hears of the woodcutters fortune and throws his axe into the river and starts crying. When the God of the Mountain bring up a gold the greedy neighbor claims it as his own. The god refuses to give him it and doesn’t give him any axes. The moral of the story is that honestly has it’s own reward.